Cardinal golfers shine at the Porter Cup! 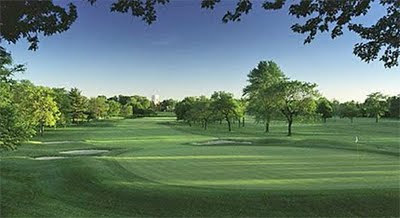 Three Stanford golfers placed in the top four spots in the Porter Cup tournament played at Niagara Falls Country Club. Playing against a strong field of college players and other amateurs incoming freshman Andrew Yun tied for first and lost in a playoff while David Chung and Sihwan Kim tied for fourth place. Andrew finished at 6-under 204 with rounds of 70-66-68, David was at 206 with rounds of 68-70-68, while Sihwan also was at 206 with rounds of 69-69-68. Full scoring can be found at http://www.golfstatresults.com//public/leaderboards/player/static/player1587.html and an article about the event can be found at http://www.portercup.com/News_09Gielow_article1.html. Incoming freshman Andrew Yun of Chandler, Arizona, finished tied for 43rd while All-American Steve Ziegler missed the cut in the 103rd Southern Amateur held in Cordova, Tennessee, at the Chandler Country Club. Andrew had rounds of 70-74-72-73 to finish 17 strokes behind the winner while Steve had disappointing rounds of 72-74. The next event with Stanford players entered should be the Porter Cup July 22-25 where at least 3 Cardinal golfers are scheduled to play, David Chung, Sihwan Kim and Andrew Yun again. 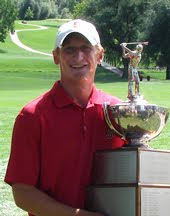 All-American junior to be Steve Ziegler continued his fine summer play with a marathon win in the Colorado Golf Association match play championship. Below are results from the Player's Amateur where David Chung, Graham Brockington and Dodge Kemmer competed. Steve Ziegler of Broomfield was the beneficiary of the last switch in momentum as he won the last three holes of the match for a 1-up victory and his first CGA championship. But Ziegler turned out to be the last man standing as Gempel apparently ran out of gas and finished double bogey-bogey-bogey. The recent University of Colorado graduate missed a 2-foot par putt -- his second of the final 18 holes -- on the 36th hole to end the match. Gempel tried to be philosophical about what happened down the stretch. Ziegler was pushed for the first time all week. In his first five matches at Bear Creek, the player from The Ranch Country Club was 18 under par and his closest match was 4 and 3. On Friday, he played his first nine holes in 5-over-par 41, but was 2 under for his final nine. That included a 78-yard hole-out for an eagle on the par-4 10th hole that squared the match. And though Gempel rebounded to regain the momentum with birdie putts of 1 foot, 8 feet and 8 feet in the middle of the back nine, Ziegler prevailed in the end. For Ziegler it was another in a long list of impressive accomplishments in the last several years. He’s won two state high school titles, claimed his first college victory, was one of eight American college players selected for the prestigious Palmer Cup team and made the round of 16 at last month’s British Amateur. And now he‘s the 2009 CGA Match Play champion. Ziegler joins a list of CGA Match Play champions that includes Hale Irwin, Steve Jones, Brandt Jobe and Kevin Stadler. In the Players Amateur held at Hilton Head, South Carolina, recent graduate Dodge Kemmer finished tied for 11th with rounds of 70-78-74-68, David Chung was 18th with rounds of 72-73-75-71 and Graham Brockington missed the cut after rounds of 80-82-75. In the US Public Links event where Sihwan Kim qualified to compete, Sihwan failed to make match play by two strokes after rounds of 74-77. Sihwan was playing at the Jimmy Austin OU Golf Club in Norman, Oklahoma. Complete results can be found here. In winning, Stanford's rising sophomore David Chung, adds his name to the Pinehurst Heritage Hall plaque for North & South Champions, which also includes Francis Ouimet, Jack Nicklaus, Curtis Strange, Davis Love and many other greats of the game. David defeated Wes Bryan 4 and 3 in the 36-hole final. The grueling event included 5 other matches to reach the finals. Steady and at time spectacular play by David marked his run through the tournament. In every match on the fames, tough Pinehurst #2 course David was no worst than even par. David's hometown newspaper, the Fayettville Observer, provided this story. A press release from Pinehurst is included below and here you will find a story in the Southern Pines Pilot. In addition, here's GolfWeek's story on David's win. 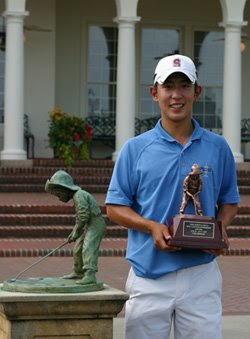 VILLAGE OF PINEHURST, N.C. (July 4, 2009) – “No mistakes” is what Fayetteville, N.C. native David Chung needed and delivered to win the 109th North & South Men’s Amateur Championship on Saturday with a 4-and-3 win over Chapin, S.C.-native and South Carolina Gamecock golfer Wes Bryan. Chung was 1-down after the first 18 holes of play on the 7,342-yard, par 71 Pinehurst No. 2 course. But with a 30-foot putt on the difficult par-4 5th hole for birdie, the tide of the 36-hole final match on Saturday began to turn in his favor. Neither player appeared tired throughout the day, trading birdies and holes throughout the round. The match was all-square through the first 12 holes, when Chung carded back-to-back birdies on holes 13 and 14 to take a 2-up lead. Chung missed a par putt on 15th to lose the hole with a Bryan par, and followed it by a par 5 on the 16th to Bryan’s birdie to set the match back to all-square. Bryan nailed a 10-footer on the 18th for birdie, but Chung would hold on to par with a 20-footer to end the morning’s play at 1-up, Bryan. Although Bryan would card a winning par and birdie on the 21st and 22nd holes to go 3-up, The afternoon holes took a decisive turn with Chung’s 20-footer on the 23rd hole to set the match at 2-up, Bryan. Chung would take charge directly following with five birdies in the next 10 holes - the 26th, 28th, 31st, 32nd and 33rd holes. With birdies again on the 13th and 14th holes of Pinehurst No. 2, the short par-3 15th would set Chung for a birdie putt 10 feet from the hole. Bryan flew the green and putted from the back left swale past the hole, rolling to the front side of the green. Bryan would land within 4 feet of the hole on his 3rd shot, but Chung sunk his final birdie of the day to settle the match at 4-and-3. This is the third time Chung has competed in the North & South Amateur Championship. In winning, his name will be added to the Pinehurst Heritage Hall plaque for North & South Champions, which also includes Francis Ouimet, Jack Nicklaus, Curtis Strange, Davis Love and many other greats of the game. He heads to Hilton Head for a tournament before returning to Pinehurst in two weeks to caddie for his sister, who will play in the Women’s North & South beginning on July 14. Pinehurst Resort, Village of Pinehurst, N.C. Located in the North Carolina heartland, world-renowned Pinehurst Resort is a 2,000-acre historic property featuring spa, golf, tennis, family, events and leisure recreation. 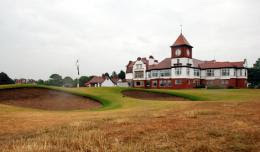 Widely known as the cradle of American golf, it has hosted more single golf championships than any other site in America, including the U.S. Open, PGA Championship, Ryder Cup Matches, PGA Tour Championship and many others. In 2008 it became the only resort to top the coveted Travel +Leisure Golf Best Golf Resort list for an unprecedented third time, as chosen by its readers. Pinehurst is a registered trademark of Pinehurst, LLC. See pinehurst.com or call 800-487-4653 for a complete list of events and activities. The 112th NCAA Championship ended with 5th ranked Stanford finishing 20th out of 30 teams at the historic Inverness Club in Toledo, OH. Host to 8 major championships, the course offered a stern test to the nation's best collegiate golfers as 30 teams are competing through May 30th. A total of 7 Pac 10 teams are competing in the finals. Stanford improved it's previous best round by 10 strokes at 288 total (4 over par) in the 3rd round, but still wound up the stroke play portion of the championship in 20th place. Only the top 8 teams continue onto to the first match play portion in the tournament's history. Three of the 8 remaining teams are Pac-10 teams ASU, USC and Washington. Senior Dodge Kemmer ended his career at Stanford with a fine 4-under 67 as he tied for 60th overall. Leading Stanford's in this event as he has much of this season, sophomore Steve Ziegler shot a final round 76 to finish tied for 30th, while sophomore Sihwan Kim had a 72, freshman David Chung a 73, and senior Daniel Lim an 83 in their final rounds. It was a disappointing 2nd day for Stanford as they moved back in the standings to a tie for 25th with a team score of 14-over par 298 and after two days stands at 35-over par. Once again the back nine was the problem for Stanord with three golfers shooting 40 or higher. The Cardinal now is 35 shots behind the leading Oklahoma State team. All Pac-10 performer Steve Ziegler fired a fine 69 and is tied for 16th overall at even par 142 while Daniel Lim had a 1-over 72. Others struggled as David Chung shot a 78 and Dodge Kemmer and Sihwan Kim had 79s. ASU and Washington remain in contention for the title in 4th and 5th place respectively at 7-over and 11-over par. Stanford got off to a solid first 9 holes (starting on hole 10) but the back nine proved to the undoing for the team as they ended the first day of play 21 over par and in a tie for 22nd, or 17 shots behind the leading Georgia and Oklahoma State teams at 4 over par. After going out in 3-over par on the first 9 holes, scoring for the Cardinal ballooned to 17-over for the last 9 holes. Steve Ziegler led the way with a 2-over 73 followed by Dodge Kemmer's 76, Sihwan Kim's 77, Daniel Lim's 79 and David Chung's 81. Washington is the leading Pac 10 team in a tie for 4th place at 9 over par. Stanford will be moving onto the NCAA Finals to be played at the Inverness Club in Toledo, OH, after finishing 4th at NCAA Regional play in Austin, Texas. FINAL RESULTS: Battling a tough course and 6 other teams with a chance to make the top 5 and qualify for the NCAA Championship, the Cardinal came thru with the day's 2nd best round of 11 over par. For the 2nd straight day Stanford was led by senior Dodge Kemmer with another 1-under 70 as he finished tied for 4th individually. All-American sophomore Sihwan Kim fired a 1-over 72 to finish tied for 12th, while freshman David Chung bounced back from two higher rounds with a 73 to finish tied for 56th overall. All-Pac-10 sophomore Steve Ziegler struggled to a 79 to finish tied for 37th and senior Daniel Lim carded an 81 to also finish tied for 56th. Congrats to the team for a hard fought tournament in which everyone made significant contributions. Joining Stanford from this regional were Florida, Texas Tech, host Texas and Michigan. Cal finished in 9th place 8 shots off the cut-line to qualify. DAY TWO RESULTS: After a tough 2nd round, the Cardinal is in a battle for one of the top 5 spots to move on to the NCAA finals. Stanford sits in 5th position at 25 over par --- there are six other teams within 9 shots of Stanford's score so almost the entire field is still alive. The top three teams have a clear lead with Florida in 3rd at 12-over par and UNLV at 17-over, or 8 shots better than Stanford. 2nd round play included Kemmer's 70, Kim's 74, Ziegler's 77, Chung's 78 and Lim's 79. No doubt play will need to improve on the last day for Stanford to move on. ROUND ONE RESULTS: Stanford finished the day in 4th place at 10-over par, a total of 12 shots behind Texas Tech. Steve Ziegler had a 1-under 70 to tie for 3rd, while Daniel Lim had a 73, Sihwan Kim a 75, Dodge Kemmer a 76 and David Chung a highly unusual for him 82. Only one team played there way out of the chance to finish in the top 5 and move on to the NCAA championship finals. A total of 7 Pac-10 have advanced to the final stage of the NCAAs from the six different regionals including Washington, ASU, Arizona, Oregon, USC and UCLA. Regional results can be found at http://www.golfstatresults.com. PRE-TOURNAMENT REPORT: Stanford earned a top seed in the Austin regional in Texas. One of 9 Pac-10 teams moving on to 6 regionals around the country, the Cardinal join USC and Washington as top seeds in the tournament reflecting the recent dominance of the NCAA championship in recent years. Cal will be joining Stanford in the Austin regional. Stanford's team includes sophomores Steve Ziegler and Sihwan Kim, freshman David Chung and seniors Dodge Kemmer and Daniel Lim. Play began at the University of Texas golf course May 14 and continued thru May 16 with the low 5 teams out of 13 teams in the region moving on to the NCAA Championship Finals to be held May 26-30 in Toledo, Ohio. 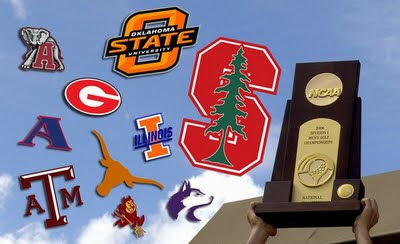 Stanford comes off a national championship finish in 2007 and a runner-up finish in 2008. A total of 81 teams in 6 regionals around the country will be competing for a total of 30 spots in the finals, with 5 teams from each region moving on. Click here for a complete recap of the NCAA regionals around the country. STANFORD, Calif. - As reported at the gostanford.com website, Sophomore Steve Ziegler and freshman David Chung both earned All-Pac-10 honors, as the annual awards were released today by the conference. Click here for the complete announcement from the Pac-10. Ziegler earned first-team All-Pac-10 honors after being named an honorable mention last year. The Broomfield, Colo. native carries a 72.3 stroke average over 30 rounds. He collected five top-ten individual finishes and three top-25 places over the year along with shooting a low round of 65 at the USC/Ashworth Collegiate Invitational, where he picked up his only individual crown of the season, and posting his best three-round total of 202 at the U.S. Intercollegiate. Chung was selected second-team All-Pac-10 in only his rookie season. The freshman out of Fayetteville, N.C. has recorded a 73.17 stroke average so far over 30 rounds and has picked up two top-10 finishes, including his best at the U.S. Collegiate Championship at the Golf Club of Georgia, where he took third. He also notched four top-25 finishes, carded a low-round of 66 in Georgia and a three-round low of 209 at the USC/Ashworth Collegiate Invitational. The Cardinal will learn Monday which NCAA Regional competition they will be competing in as it tries to qualify for its third straight NCAA Championship. In an unprecedented sign of the times perhaps, five of the nine first team honorees are from outside the US including co-players of the year Matthew Giles (USC-Australia) and Nick Taylor (Washington, BC). The Pac-10 Championship is underway in Seattle, being played at the historic, private Seattle Golf Club. The host Washington team is coming off a record-breaking performance at Stanford in the US Intercollegiate where they swept the top three individual places and won the team title easily in record fashion. Stanford sends it's nationally ranked team (5th) into this competition in which each team sends six players instead of the typical five players competing. Playing competitors are Steve Ziegler, David Chung, Sihwan Kim, Dodge Kemmer, Daniel Lim and Graham Brockington. Injured All-American, Joseph Bramlett, has just started to play again and may be available for the NCAA regionals May 14-16. The Cardinal finished 4th at 17-over par for the 2nd straight tournament as Washington swept the field with a dominating 16-under performance. Last week at Stanford Washington swept the top three individual spots and this week at the Pac-10 championship they swept the top two individual spots. Final round results for Stanford included a 70 from freshman David Chung (290, T-13), 71 by sophomore Sihwan Kim (291, T-16), 73 by senior Daniel Lim (291, T-16), 71 by sophomore Graham Brockington (297, T-35), 76 by senior Dodge Kemmer (298, T-38) and a 77 by sophomore Steve Ziegler (300, T-44). Next up will be regional play in the NCAA championship the May 14-16 in which Stanford is likely to be placed in the West region. Stanford's team had good results with a 1-under par team score of 359, leaving the team 16-over par after 3 rounds, but fell further behind the red-hot Washington home team which continued its outstanding play in recent weeks. Washington's lead stretched to 7 shots after a blistering 13-under third round of 347. The Cardinal scoring was led by Daniel Lim's 2nd 70 (70-78-70/218 T-14) and Sihwan Kim's 71 (80-69-71/220 T-20), followed by David Chung's 72 (72-76-72/220 T-20), Steve Ziegler's 72 (76-75-72/223 T-34), Graham Brockington's 74 (76-75-74/226 T-44) and Dodge Kemmer's 75 (73-74-75/222 T-26). Washington's strong 3rd round included rounds of 65, 67 and 68 providing the difference with the rest of the field, although Oregon is making a strong showing in 2nd place after a third round 350. Surprisingly, 2nd ranked nationally USC is at 31-over par, 15-shots behind Stanford and 39 strokes behind Washington. No. 4 Stanford completed two rounds of play today at the 2009 Pac-10 Championships at 6,836-yard, par-72 Seattle Golf Club, shooting a cumulative 17-over-par 737 over 36 holes to settle into a tie for fourth place. The Cardinal have two more rounds over the next two days to catch the top of the field, led by hosts No. 5 Washington, which leads by four strokes with a plus-five 725. 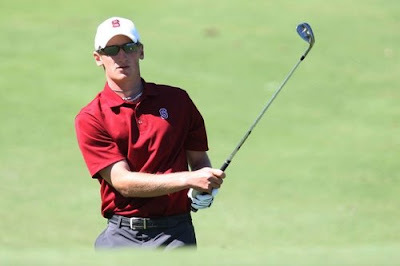 Senior No., 93 Dodge Kemmer had the best outing for Stanford on the day, shooting a three-over-par 147 to rest in a tie for 18th place. Senior Daniel Lim and freshman No. 46 David Chung followed close behind, as each posted a four-over-par 148. Lim knocked in six birdies, four of which were on the back-nine, in the first round to post a two-under-par 70. Chung sunk an eagle on the par-five 14th hole and birdied twice in the first round on his way to an even-72. Sophomores Sihwan Kim and No. 9 Steve Ziegler recorded the two next best scores for the Cardinal. Kim did not start out like he had hoped to, but bounced back in the second round with a three-under-par 69 to give him a five-over-par 149 for the day. 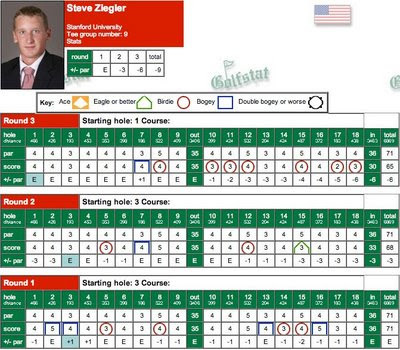 Ziegler was consistent through his two rounds, carding a 76-75 to put him at seven-over and in a tie for 35th place. Sophomore Graham Brockington finished the day at eight-over-par. Stanford is paired with California for tomorrow's third round, and will be teeing off from the first hole at 8 a.m. Live scoring can be found at http://www.golfstatresults.com/public/leaderboards/team/static/team_players_1479.html. NORMAN, Okla. – The United States and European teams have been announced for the Palmer Cup presented by Fisher Capital Partners at Cherry Hills Country Club in Denver. The annual Ryder Cup-style competition will be played June 3-5. The American team will consist of Bud Cauley of Alabama, Oklahoma State’s Morgan Hoffmann and Trent Leon, Jamie Lovemark of Southern California, Georgia’s Adam Mitchell, Cameron Tringale of Georgia Tech, Marquette’s Mike Van Sickle and Colorado native Steve Ziegler of Stanford. It will be the second Palmer Cup appearances for both Lovemark (2007) and Mitchell (2008). Representing the Euros will be Jorge Campillo of Indiana, Arizona State’s Stephan Gross, Leonardo Motta of IULM Milan, Augusta State’s Henrik Norlander, Chris Paisley and Robin Wingardh of Tennessee, Texas A&M’s Andrea Pavan and Tim Sluiter of Southern California. 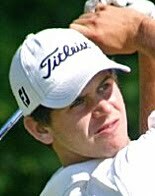 Spain’s Campillo will be competing in his third Palmer Cup (2007, ‘08) will Sluiter of The Netherlands will appear in his second (2008). Gross is the first Palmer Cup participant from Germany. Motta and Pavan hail from Italy, Paisley from England and Norlander and Wingardh from Sweden. The United States leads the all-time Palmer Cup series 6-5-1. Andrew Yun, who will be coming to Stanford for the 2009-10 season, won his second Arizona Champions Stroke Play title at the TPC Scottsdale Champions Course by 8 strokes. Andrew, who is 17, was the only player in the field to finish under par as he finished at 4-under par 276, with rounds of 69-70-72-65. A recap of the tournament can be found at http://www.azgolf.org/main/index.asp?CategoryID=0. 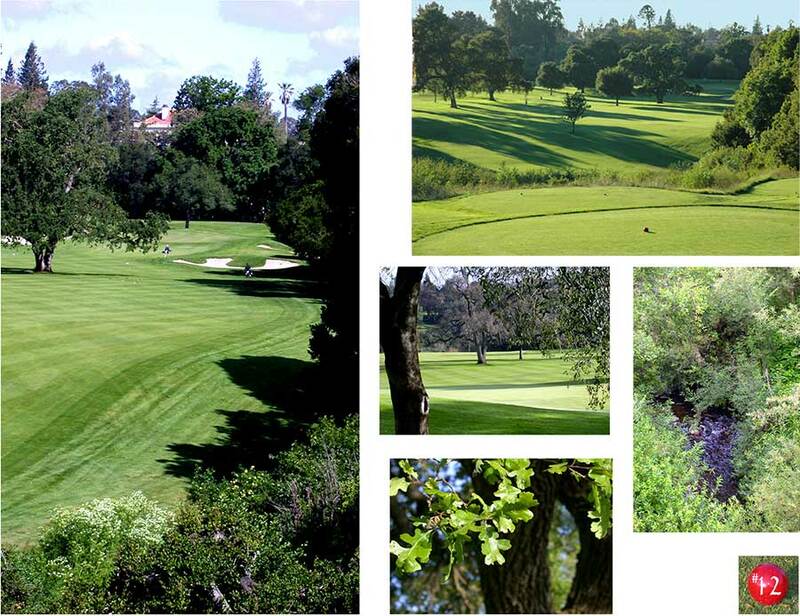 The Cardinal hosted a top field for the US Intercollegiate played on the outstanding Stanford golf course. Among the top 25 teams in the country are USC (3), Stanford (5), Washington (9), Texas (18) and ASU (22) while UCLA (27) and Cal (30) are not far behind. Washington continued it's scorching play to win Stanford's event by 15 shots at 36-under par on a perfect day for scoring as temperatures reached into the high eighties were combined with low wind. In a highly unusual outcome, three Washington players led by Nick Taylor swept the top three individual places at 12-under, 11-under and 10-under as both Taylor and teammate Darren Wallace fired final round 63s. Stanford finished 4th overall at 11-under par and was once again by a led by sophomore Steve Ziegler's strong play as he finished tied for 4th individually at 8-under with rounds of 68-66-68. Steve was followed by Dodge Kemmer's 2-under 67-71-70, David Chung's 68-73-69, Sihwan Kim's 69-72-71 and Daniel Lim's 74-70-71. Playing as individuals were Graham Brockington who had a career best tournament with rounds of 67-75-72 and Jordan Cox with 74-69-78. It was clear throughout this year's event that the Stanford course lacked the teeth to challenge the field as the rough was thin throughout making it easy to reach the greens, and the firm fairways led to unusually long drives. Also, the greens, although firm, were not as fast as in recent years so the number of three-putts was down. The combination led to the record scoring throughout the field as a total of 81 rounds in the 60s were shot, and with a total of six players shooting all three rounds in the 60s, something that has rarely occurred in the past. There were three rounds of 63 shot, one 64, four 65s and eight 66s. The total team and individual scoring also were record lows. Last year's tournament was won with a total score that was 24 shots higher. Stanford in 2008 finished 2nd at 1 over par, or 12 shots higher than in this year. Complete scoring from GolfStat can be found here. Day one ended with record low scoring in ideal conditions. Winds were light and temperatures reached the high 70s by mid-afternoon, while the rough was not as tough as in recent years. The combination led to numerous sub-70 rounds as Washington's team took an 8-shot lead at 23-under par heading into the final round with their team members carding 7 rounds in the 60s, led by Tze Huang Choo's 10-under 130 and rounds of 65-65. Stanford found itself in 5th place at 9-under led by Steve Ziegler's 6-under 68-66 start putting him in 3rd place overall. Next came Dodge Kemmer's 2-under 67-71, David Chung's 68-73, Sihwan Kim's 69-72 and Daniel Lim's 74-70. Playing as individuals Graham Brockington opened with a fine 67 followed by a 75 while Jordan Cox had rounds of 74-69. Freshman Wilson Bowen is redshirting and did not play. Coach Ray invites the Stanford golf community to come out and enjoy the great play on our wonderful golf course! Here's an audio interview Conrad had with the Bay Area's flagship sports talk station, KNBR --- http://www.knbr.com/common/global_audio/201/6468.mp3. The Cardinal finished in 2nd, two shots behind Clemson, in the prestigious US Collegiate Championship played at the Golf Club of Geogria. Stanford led by 4 shots after two days against the very strong field by 4 shots after two days of play. This 2nd place finish against a field which had 8 of the nation's top 10 teams (including Pac 10 rivals UCLA and USC), solidifies Stanford's top 5 ranking despite playing without their injured All-American Joseph Bramlett. Scoring conditions were difficult for day 3 as only one player in the field broke 70. Leading the way for the Cardinal was freshman David Chung (75-66-73: finishing 3rd overall) and sophomore Steve Ziegler (70-71-75: tied for 4th). Senior Dodge Kemmer followed (72-77-73: tied for 25th), then sophomore All-American Sihwam Kim was next at 71-76-81: tied for 44th) while senior Daniel Lim (76-81-78: 72nd). In round two, Chung's spectacular 66, easily the best of the day and the 2nd lowest round of the tournament behind Erik Flores' 65 in round 1, included 7 birdies and one bogey. David ended up two shots behind the tournament's individual champion to continue his outstanding freshman season. It's fitting that Georgia is location of the US Collegiate a week before the Masters starts as the nation's best teams gathered at a top venue, the Golf Club of Georgia. Hosted by Georgia Tech and including 8 of the top 10 teams in the current national rankings, the golf course is expected to provide a strong test for the best players in college. 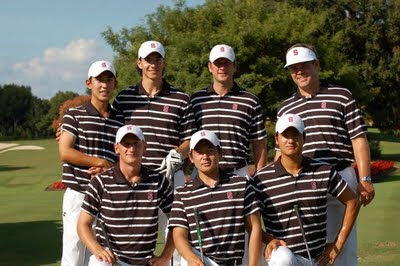 Stanford's team consists of Steve Ziegler, David Chung, Sihwan Kim, and seniors Daniel Lim and Dodge Kemmer. See the complete scoring recap provided by GolfStat. Stanford finished match play by beating San Diego State 3-1-1. Overall that left the Cardinal in 5th place out of 16 teams with an overall match play record of 8 wins, 6 losses and 1 match tied. David Chung, Steve Ziegler and Sihwan Kim won their matches by 2-1, 1-up and 1-up respectively. Dodge Kemmer halved his final match while Daniel Lim lost his only match 3-1. Complete match results vs San Diego State can be found here. Stanford lost a heartbreaker to #1 seed Indiana in the first round of match play by a 3-2 score. David Chung won his match 5-3 while Daniel Lim was a 2-1 winner. After leading all the way, with 3 holes remaining Steve Ziegler was tied but lost 16 & 17 to fall 2-1. With two holes remaining Dodge Kemmer was tied and lost the 17th and tied the 18th to lose 1 down. And Sihwan Kim was 1 down with 4 to play and lost the next two to lose 3-2. Full first round match play detail can be found here. In the afternoon's consolation bracket match versus Texas A & M, Stanford won the hard fought contest when Daniel Lim won his final two holes for a 2-up victory. 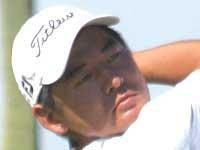 Other wins came by Sihwan Kim (4-3) and Dodge Kemmer (2-up). Stanford will now face 2nd seeded San Diego State. Full 2nd round match play results can be found here. Stanford moved into the championship bracket of the Callaway Collegiate match play event played at the Farms GC in Rancho Santa Fe, CA. Once again Stanford was led by recent tournament winner, sophomore Steve Ziegler, with qualifying rounds of 72-74 which placed him in a tie for 10th individually. Playing in windy and sometimes wet conditions, other individual scores were Dodge Kemmer's 72-77, Daniel Chung's 74-78, Daniel Lim's 79-78 and Sihwan Kim's 82-75. As a result of qualifying in a tie for 7th Stanford receives the 8th seed in the championship bracket and moves onto a head-to-head match with the number 1 seed Indiana which finished 16 shots ahead of the Cardinal. The match play bracket with live scoring updates can be found here. Complete individual scoring can be found here at Golfstat.com. Two matches per day will determine the match play results, with the first round winners moving ahead in the championship bracket while the loser will move into the consolation bracket. The event is held at the Farms Golf Club. As with all images, click to enlarge photo. 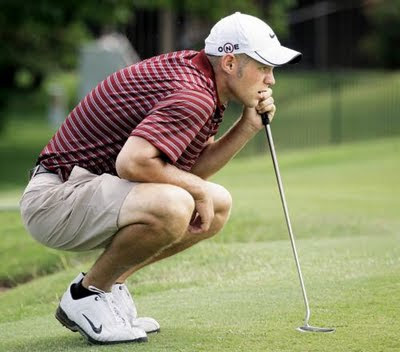 Steve Ziegler received both national recognition as Men's College Player of the Week from Golf World and Pac-10 honors being named golfer of the month for February. 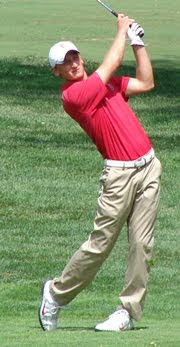 NEW YORK - Golf World has announced its "Men's College Player of the Week" for the period between February 23 and March 1. The feature will appear in the March 9 issue of Golf World and can be viewed online now at www.golfworld.com. 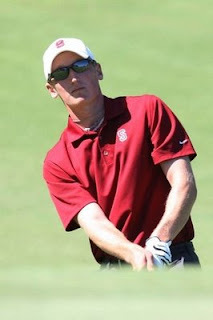 This week's honoree is sophomore Steve Ziegler of Stanford. Ziegler hadn't had a round lower than 70 all season until closing with a 68-65 to win the USC/Ashworth Collegiate Invitational. His nine-under 204 also helped the Cardinal claim the team title by 10 strokes over BYU. Ziegler has a 72.50 average in six tournaments this season, and he has now finished in the top-11 three times in 2008-09. See the next article below for complete summary of the Ziegler's great tournament plus the Cardinal's first win of the season. The team's win at USC has moved Stanford to 3rd on the Golf Digest/Golf World's rankings. The Pac-10 named Steve the golfer of the month with the following announcement: "Ziegler, a sophomore from Broomfield, Colo., won his first career collegiate individual title in capturing medalist honors at the USC Collegiate Invitational. 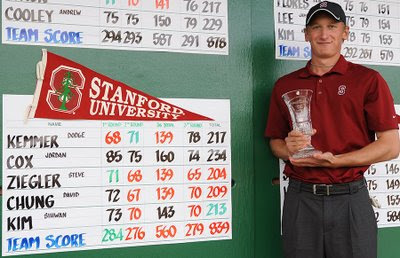 He fired a nine-under 71-68-65--204 to win the event by a single stroke and lead Stanford to the team title. His career-best round of 65 on the final day included six birdies on the back nine. Ziegler also posted a top-10 finish in Stanford's other tournament in February, placing seventh at the UH Hilo Intercollegiate. Ziegler was under par in four of six rounds for the month (and even par in the other two) with a 69.5 stroke average in the two tournaments." Stanford wins the USC Collegiate by 10 shots! As always, click any photo to enlarge. The Cardinal broke through with their season's first win led by Steve Ziegler's scorching final round 65, at the USC Collegiate played at North Ranch CC in Westlake Village. The team's 13-under score of 839 was the lowest in the 31-year history of the event. Ziegler's 9-under 204 total led to his first individual tournament win after rounds of 71-68-65. Steve shot a blistering 6-under 30 on his final nine holes. David Chung finished tied for 5th with rounds of 72-67-70, Sihwan Kim finished tied for 10th shooting 73-70-70, Dodge Kemmer tied for 18th with rounds of 68-71-78 and Jordan Cox tied for 75th with rounds of 85-75-74. As individuals, Daniel Lim tied for 26th (74-68-77) and Graham Brockington was 77th (74-75-86). The Cardinal will be competing next at the Callaway Golf Collegiate Match Play Championship. This will be a different type of tournament for the Stanford men because it will be in a “match-play” style instead of their usual “stroke-play.” The NCAAs have converted to match-play style this year, where one team squares off directly against another team, more like a basketball or baseball tournament. The best golfer on one team faces off against the best golfer on the opponent’s team, and so on, for five participants per team, which puts more pressure on each individual golfer. The full Stanford Daily's excellent event coverage can be found here. | Stanford's gostanford.com website's full tournament report. | Full tournament scoring results can be found here. Stanford jumped off to a 2-stroke lead after 36 holes played on day 1 of the USC Collegiate played at the private North Ranch CC in Westlake Village, CA. A trio of Cardinal players, Steve Ziegler, David Chung and Dodge Kemmer all shot 3-under rounds of 139 to tie for 2nd individually. Sihwan Kim posted a 1-over 143 while Jordan Cox shot a 160. In addition, competing as individuals are Daniel Lim who shot 142 and Graham Brockington who shot 149 on the first day of play. The tournament wraps up with one more round being played on Tuesday, Feb 24th. 4-time AJGA All-American Andrew Yun, coming to Stanford for the 2009-10 season, finishes tied for 5th in a top field of juniors playing at Carlton Oaks in Texas. Andrew had rounds of 69-74-71 to finish 2-under par and 3 strokes out of first. Here are complete results from the event. Yun's scores below show that with better play on the par fives he would have won the event as those ahead of him on the scoreboard all finished under par on par 5 holes.